This pizza crust recipe has been my go-to recipe for years. It’s so easy to make — and it’s really hard to ruin. In fact, I’ve made it dozens upon dozens of times and I don’t think I’ve ever messed it up. That’s saying a lot coming from someone like me, who can even ruin simple recipes like Reese’s Peanut Butter Bars. Pour the warm water into a bowl and sprinkle the yeast over it. Stir to dissolve. Dump onto a floured surface and knead dough for two to five minutes until smooth and no longer sticky. 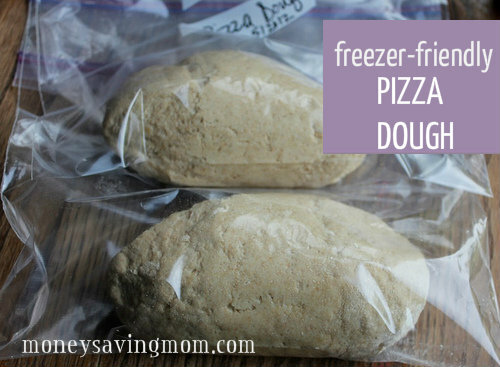 To freeze: Cut lump of dough in half and place each half in an airtight freezer bag. Freeze for up to 4-6 weeks. To bake: Place frozen dough in a greased bowl and thaw at room temperature for at least 3-4 hours. Roll out and shape onto a greased pizza pan. Add pizza toppings of your choice. Bake at 500 degrees for around 10 minutes (until the crust looks crispy and lightly browned). If you don’t want to mess with freezing the dough, take the kneaded dough and roll out and shape onto a greased pizza pan. Add pizza toppings and bake as directed above. So, this recipe makes two pizza crusts? Yes — but they are thicker, so if you like thinner crusts, you could make three out of it. Been making your pizza dough for a very long time. I agree it’s not the best frozen. If you want to try another recipe you ought to try PW pizza dough recipe it’s very easy but it requires time for rising. It also freezes much better. I haven’t made any to freeze yet but I made this pizza dough for homemade pizza last night and my family loved it!! My 4 and 7 year old each ate 2 pieces and my 8 mo old ate almost a whole one himself! Thanks! Is there any rising at all? That seems odd for a yeast dough. I’ve been making this pizza dough for a few years now and at first I didn’t let it rise. I found it hard to roll out and not chewy enough for me. Now I make it a little early and let it rest/rise for 30-45 minutes, which still isn’t very long for a yeast dough, but I think it makes a big difference. Plus I punch it down, peel it out of the bowl and flop it on the counter so all I have to do is press out the edges a little bit–no rolling needed. Agree. Big difference. I usually make 3 pizzas. I noticed that the 2nd one was better than the first, and the 3rd one was the best of all! So now I let the dough sit for a bit first – not long – just while I’m getting the toppings ready, changing diapers, answering the phone, breaking up fights, etc. You can let it rise for 20-45 minutes, if you prefer. Or it will rise when you thaw on the countertop. However, if you’re in a hurry, you can stick it straight in the oven. I’ve found, though, that by the time I put the toppings on and heat the oven up, it’s risen some so I never bother with letting it rise before rolling it out when making it fresh. So, it may just be me, but freezing it means I have to thaw it, and that would take longer than just mixing up the dough (which only takes like 10 minutes, and I do it in the stand mixer so I can multi-task too.) It would be different if I were going to pull it out in the a.m., but since pizza is our go-to “I didn’t really plan anything” meal, that doesn’t work for us. When I make pizza dough, I double the recipe. The extra dough gets rolled out and the discs are separated with parchment paper. (Or you can par-bake them if you prefer they be a little sturdier.) Then I just pull out how many pizza dough discs I need for dinner, and the dough literally thaws as quickly as you can put the toppings on. Dinner can be ready in about fifteen minutes! Now that I might try–or maybe even doing the toppings and freezing the whole pie? I’ve frozen them after cooking before, not too bad (but not like fresh). That is what I like to do when I have freezer space. Saves SO much time! This is what I do! It works great and you just cook it like a frozen pizza you would buy at the store. Keep in mind that you will need to freeze each crust individually, then you can pack them together with parchment inbetween for longer storage. If you have raw dough and try to freeze several rolled-out pizza crusts together while they are still soft, you’ll end up with an ice-chunk of pizza dough! Sorry if I wasn’t clear about the whole process earlier! I do this too, but I go so far as to pre-bake mine. Then they get flash frozen and wrapped up. I’ve heard of some people storing them in trash bags in the freezer, but I’m not sure about the health safety of that plastic. You can get food safe “trash” bags at any GFC if you have them in your area or restaurant supply store. Restaurants use them for lining things like lettuce bins. They are generally quite a but thicker and normally clear. I made a healthier cookie dough. I used whole wheat flour, apple sauce instead of butter and flax seeds. I made your crust for the ham and cheese pizza pockets yesterday and my family loved it – thanks! This recipe works very well in the bread machine on the dough setting or you can mix it in your Kitchen Aid and knead with the dough hook. I need to try it in the bread machine sometime! I haven’t done so yet, believe it or not! I made brown bag burritos yesterday (and a loaf of cheeseburger meatloaf that I forgot to take a picture of!!). Today I just browned some ground beef to use in the lasagna casserole when I get around to buying cottage cheese! If you want to save yourself even more time, you can actually roll out the dough and place it in between parchment paper and freeze flat. Then it takes just a couple of minutes to thaw while you put on your toppings! Dinner can be on the table in about 15 minutes!!!! Thanks Ellen! That was my exact question! A few weeks ago, I thought about making pizza dough to save money, but I found that they are only $1.99 (plain, whole wheat & garlic?) at Trader Joe’s. I know it’s still cheaper to make this at home…but I think $1.99 is a good deal. If you have an Italian grocery store nearby, try going there. Ours frequently has pizza dough on sale for 25 cents per 1 pound ball! At that price, it’s not worth it for me to mess up my kitchen! It always makes me think of Crystal and the homemade tortillas. 🙂 It makes for a very cheap dinner. Oh wow! I’m very jealous! $0.25 per one-pound ball?!?! There’s no way you can beat that price! I love the TJs dough. They used to be $0.99 at mine but have gone up in the last year (I think it is cheaper than $1.99 at mine though). I make my own a lot but I do love having this on hand or in the freezer. That sounds like a pretty good deal to me — especially for the time and mess it would save! It usually takes me around 7-8 minutes to make the dough and roll it out and another 7-8 minutes to get the toppings ready. You can buy a case of 20 frozen pizza crust doughballs at Sam’s Club for around $15. You can ask for a case at the snack bar. The crusts are very good. I made your pizza pockets the other night and we ate some for dinner and froze the rest. They were great and I am excited about having quick dinners or lunches in the freezer for my family, especially my 19 year old son! Thanks so much. (My husband helped me make them and both of us had fun making them). I have made your pizza dough recipe for several years as well. And recently I started rolling the dough out and putting on the sauce and toppings and then freezing it. I’m still experimenting with the cooking time, but otherwise I think it’s just as good. It has been a great freezer meal for our family. Great idea!! Do you bake it frozen or do you let it thaw a little while? I have done both. It just depends on how much time I have. When I bake it frozen I think it takes about 25 minutes. I’ve been making this pizza dough recipe and used it fresh and frozen/thawed since we got married. We eat it at least once every couple of weeks. I came up with something new to do with this dough recipe yesterday, it was mostly inspired by your ham and cheese pockets. I made ham and cheese poppers and the whole family loved them! I am excited to try this crust. Could this thaw in the frig. overnight? Someone mentioned in the comments that’s what they do so it sounds like it would work. If any one has trouble with their dough: I’ve found using cold water so the dough doesn’t rise in the freezer works best for me. Also, I’m not at home during the day for 8+ hours so I defrost the dough in the fridge rather than 3 – 4 hours at room temperature. Great tips — now I want to experiment with cold water and see what happens! How does your yeast proof in cold water? I always parbake my crust before adding toppings/sauce. A soggy bottom is my bigggggggest pizza pet peeve! I’d love to try this out.. can you please suggest some stores where I can get the best ‘active dry yeast’? thanks in advance.. I buy mine at Sam’s Club when they have get in free days (since we don’t have a membership). It’s about $4-6 for two pounds. I keep mine in the freezer and this usually last me for a year. You can buy it at the grocery store, but it’s usually much more expensive. You can get in free at Sam’s anytime by printing a one day pass from their website. In SC it is against the law to charge an upcharge so we pay the member price whether we have a membership or not. If you have a GFC (Gordan Food Center) near you you can get active dry yeast for around $3 for a 4 lb bag I think it was. You can also get fast acting instant yeast for around $2 for a 2 lb bags. If you keep it in the freezer it stays good almost indefinitely. We have homemade pizza every Friday. I need to do this! Yesterday I made Peanut Butter Pancakes, Homemade French Toast Sticks w/ homemade wheat bread, and Rice-Bean-Cheese Burritos. I use your recipe and love it! The only thing I change is that one recipe makes 2 pizzas for us. We like a thinner crust! Soooooo, you can have 4 pizza doughs ready if you double it. Super easy! Despite an extremely busy week, I was able to pull off a little freezer cooking last night. I made bbq meatballs out of the meatloaf recipe linked below for our dinner. I tripled the recipe and was able to freeze 9 mini meatloaves (enough for 2 dinners for our family of 5). I also chopped some celery for the freezer. Earlier this week, I made Curry Chicken Lentil Soup and froze the half that we didn’t eat (enough for another dinner). Finally, I froze 10 cups of cooked pinto beans into 5 bags (I made the beans in the crockpot a few days ago and kept them in the refrigerator until I could divide and freeze.) Although it wasn’t much, I feel great about being able to get a few little things into the freezer for a quick dinner when we have another busy week. Thanks for the challenge. I’ve loved this series, even if I haven’t been able to participate in all of it. We just had homemade frozen pizza last night after my son’s first ever race. I par-baked a couple crusts, added sauce & toppings and froze a couple weeks ago. Last night they allowed me to visit with family as they cooked. It was just like having frozen pizza from the store, only cheaper and tastier! Crystal, you have really inspired me to just start freezer cooking. I know you say to start small but I have some time this weekend and I’m going to put together a few casseroles and waffles and pancakes. I’m also going to make up a pot of pulled pork. That’s the only thing I have tried freezer cooking. It’s so easy and SO cheap. I spent $7 on my pork loin, about $3 on the extra ingredients, a bottle of bbq sauce that I got free with a coupon and I was able to use it 20 times for the two of us. Perfect Friday night meal. I have a question. I made pizza dough- made two pizzas and froze the rest. its been frozen since 4/10 so about a month. Then i took it out of the freezer this past weds night- its now friday afternoon. I think it would be okay. It probably won’t be light and fluffy, but I don’t think it should have spoiled or anything. Dough normally will stay good in the fridge for a few days. The smell of dough that has “turned” is very easy to notice. So give it a whiff and if it still smells like dough and not funky beer you’re good to use it. One of the bread doughs I make often will actually stay good in the fridge for 1-2 weeks. Your pizza dough may have taken some sour dough characteristics on too which makes me all the better. I wonder if you can go ahead and prepare the pizza with sauce and toppings and then freeze? That way you just pop in the oven when you’re ready to cook it! You definitely could try it — and let us know how it goes. I would cover it really well and not freeze it for more than a month or so. This is what we do and it works great! I actually do this all the time, and so long as you don’t leave it in the freezer too long it works really well. Also, you’ll want to make sure you leave it in the pizza pan if you don’t have a safe, designated place in your freezer b/c you don’t want them to break. You can also, pop them off the pan after frozen and lay them in a large plastic bag w/ wax paper in between. I’ve even used white kitchen bags (big, clean, new ones as for your kitchen trash can) w/ waxed paper. You can pop it right in the oven, or leave it out a little to defrost, or defrost in the fridge. Put the pizza pan in when you turn on your oven to preheat and this works well too! I have been using this pizza dough a long time too. We really like the recipe and make it often. I sometimes add pizza seasoning to the dough. I also make 3 pizza out of each batch as we really like thin crust. I use almost the same recipe for my pizza dough, but I add 1/4 cup of Parmesan cheese and I put it in my bread machine on a dough cycle. Then freeze. When I make one batch, I make four or five in a day and freeze them all. I made brown bag burritos yesterday! I never froze the pizza dough because I forget to take things out to thaw. I do LOVE the idea of rolling it out and freezing the shells. We will definitely be trying this – pizza is one of the only things my picky 7-year-old will eat!! I made frozen pizza crust last week. So good. Yesterday I made more cookie dough. This time healthier. I have made this recipe 2 times this week! I share it with everyone I know! So simple and delicious. Why pay $10-15 for a delivery pizza?! Last night, we topped our pizza with roasted fennel and leeks, mozzarella cheese and pepperoni. Delicious! 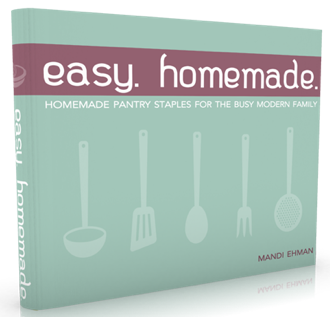 I have been making Easy Homemade Hot Pockets and Freezing! My fam is loving them which is saying alot since they are soooo picky! I made your pizza pockets and we loved them! The pizza dough was great and super easy. We love another dough from Melskitchencafe.com, but that has to be made the night before so I love that I can make yours so easily and quickly. I do have a question though. The recipe says to dissolve the yeast in water. Are you supposed to let it proof a bit or just dissolve a bit before adding the other ingredients. Also, I used honey instead of sugar and really liked it. Thanks! You can let it rest for five minutes, but you don’t have to and it still works well. I usually just stir it in well and add the rest of the ingredients. However, if I’m working on other things in the kitchen and can let it rest, I will. I have been loving all your posts! I made bbq chicken enchiladas last night and they were a big hit! I’m so behind 🙁 , but still loving these freezer challenges. I made the lasagna casserole today and even though I have a lot of catching up to do, I feel better now that I’ve crossed that off my list. Thanks as always, Crystal! I seem to be about a week behind, but the kids and I went to the zoo today (they ate frozen pb sandwiches!!) and when we got home, I made Pizza pockets. Since we have a large family, it was a meal for tonight, and lunch for two days in the weeks to come! Do you all have low cost, creative toppings to share? We usually get take and bake pizzas for about 10.00. I have a hard time making one for all of us for much less than that if I get cheese, pepperoni, etc….I’m sure homemade is much healthier and tastier, I’m just wondering if there are cheap pie ideas I’m missing. It is hard – I find that especially for a larger family pizza is not as cheap a dinner option as other things. But it helps everyone feel like they’re not being deprived of eating a popular food that everyone else is eating! Cheese and meat are high – to come out ahead you have to find them on sale. I usually use ground beef or a little (clearance) Italian sausage. Bell pepper from the garden or bought on sale. Go easy on the cheese. Probably could go a little cheaper, or higher depending on your region and your tastes, but that is a lot less than $10. We don’t typically eat a lot of ground beef, but that’s a good suggestion. I have a terrible time with cheese. I buy it on sale, but we go through it Sooo fast. I guess we’re just chees-y people. 🙂 Thanks for taking the time to share with me. I put lots of random things on pizzas to basically get rid of it without waste. Like when I make pasta, I usually save out a cup of the sauce and put it in the freezer rather than use a whole jar, and then combine a couple cups of sauce to make pizza sauce. Half an onion or a tomato that isn’t going to get eaten before it goes soft? I chop it up and toss in the freezer. When it’s time to make sauce I cook the random bits in a bit of olive oil to bring up the flavor, then add the pasta sauce. Extra nutrition, more texture for the pizza, and would have just gone in the trash. I stock up on fresh veggies at their lowest price, and saute them lightly, then put them in bags in the freezer. Mushrooms are one of those things that you can sometimes get a great deal on when the store overbuys. They’re often starting to wilt a bit, but that’s fine, I just cook them as soon as I get home. Summer squash is one of my favorite things to put on pizza (pre-cooking helps prevent soggy crust). Wilted greens (leftover salad, spinach, kale, anything but iceberg basically) are a great way to add more texture and flavor and vitamins too. On the more traditional end of toppings, I try to stock up on lunch meat when it’s cheapest, but it still ends up being pricey. Chopping up slices of pastrami, roast beef, or ham to top the pizza is a good way to stretch a few slices of lunchmeat into a meal. Meat is just supposed to be the seasoning, right? And I only buy cheese at its very lowest price. Grated, it can last in the freezer for months, and melts just fine. I used your dough to teach our elementary class at church some bread making last year 🙂 I usually make a crust and bake it at 400 for 5 minutes then freeze, sometimes I also top it before freezing. It takes up a lot more room in the freezer, but I can take out the frozen pizza and cook it like one from the store. Looks like a good recipe. We make pizza every Saturday night and I just use the dough cycle on my bread machine. Just have to plan ahead a bit! I love how simple this is, and because it doesn’t take many ingredients, it’s very frugal. This is for 2 pizzas and only costs me $.20-$.50 pizza! Could you use this dough for your ham and cheese pockets recipe? Baking at 500 seems awfully high. Id read pizzas should be baked on the bottom rack for a crispt crust. What rack do you recommend? I love homemade pizza dough! The only problem I have, since I prefer thin crust pizza, is getting the dough thin enough. But, this looks like a great recipe. I literally have this recipie taped to my fridge, in every notebook (I don’t own a cook book, just a ton of notebooks with everyones recipies I love in them) and on my planner =] It is my all time favorite pizza dough recipie! I also use it for a slightly healthier fruit pizza crust (instead of sugar cookie dough) and add a little vanilla, cinnamon, and honey to sweeten it a bit more =] My two year old loves it!! Thank you for this fast, filling, and inexpensive recipe. It really came in handy tonight. I’ve been looking for a recipe from one of your previous posts. I can’t seem to find it. I don’t remember the name of it, but I suppose it could best be described as a hot pocket. You do have to prepare a dough for the recipe. The filling is beef, refried beans and cheese – maybe. I also recall that you fold the dough over the filling, creating a half-moon of sorts. You then seal the edges w/ a fork. Can you help? I know this post is several years old, but I have a question for you about it! I’ve been making the dough for a while now and baking it on a metal pizza pan. However, tonight I tried using my pizza stone on it for the first time. After baking it for 9 minutes, the top was done, but the inside of the pizza was doughy. Do you have any suggestions for using a pizza stone – any alterations that might help it cook more evenly? Thanks! 1st time making pizza crust (or any yeast dough!). It was a little messy, but definitely worth it. Thanks for the pizza sauce pairing as well. Bye bye pizza delivery guy! Did you know your pizza dough works in a pinch for cinnamon rolls? I love how easy your dough is to roll out compared to the frozen bread dough (thawed) that my cinnamon roll recipe calls for. I made your dough fresh this morning, put half in the freezer, and turned the rest into gooey cinnamon rolls. My kids couldn’t tell the difference. They were delicious! Is this all purpose flour? Couple of questions. #1 have you ever tried rice flour as a gluten free sub and did it term out? # 2 have you tried rolling it flat into personal pizza shapes and freezing between wax paper? I am going to experiment with it, but figured I would see if anyone has tried it. Sometimes I actually boil the water in this recipe and add spinach to it. Puree and then let cool to room temp before adding the sugar and yeast. My kids don’t mind the green crust. LOL! That’s a creative idea! Thank you for sharing!